[RECAP] As soon as He used that phrase, instantly they expected Him to continue to describe this kingdom, this throne, this glory, this dominion, this forever, all of the people of earth bowing down to worship Him. And I think that as they heard this they were leaning forward, they were waiting, they were thinking it’s true, it’s real, it is going to happen, He is, He’s going to tell us that He’s going to overthrow Rome, “the Son of Man must…” And then came the next word. And here is His first description of His death. “He must suffer many things and be rejected by the elders, chief priests and teachers of the law, and He must be killed and after three days rise again.” (Mk. 8:31) And look at verse 32, “He spoke plainly,” no more parables, no more masking His meaning, no more puzzling statements, no more comments designed to dig into their minds and cause them to be confused and make them ask questions and try to sort their way through it and talk about it along the way as they were traveling with Jesus. No no, nothing hard to understand, nothing unclear, “He must suffer…” (Mk. 8:31a) Very clear. Now look what happened. “Peter took Him aside and began to rebuke Him.” (Mk. 8:32) Peter took Him aside! Peter somehow, we don’t know exactly what he did — how do you take someone aside, don’t you put your arm around His shoulder, do you grab Him by the arm? — we don’t know exactly what He did. But what we do know is, let’s say that they were together and Jesus was addressing them, Peter stepped out from among the disciples, took a hold of Him, must have turned Him around and led Him away. Peter took Him aside…and he said to Him, “God forbid! This will never happen!” (Mt. 16:22b) He used the two strongest negatives in the New Testament. There were no stronger ways to say something…to say ‘No!’ than to say, “God forbid, this will never happen!” It will not be! Peter is overwhelmed, Peter is on his feet, he cannot believe it, messiahs don’t die, not our Messiah! Not the Messiah of the Old Testament. He doesn’t die! Look what happens next. “But when Jesus turned…” See, Peter had led Jesus away and turned His back to the disciples and rebuked Him. And this is a very strong word, it’s even a word used to describe the rebuke of demons, not that Peter thinks that there’s anything demonic, I just want you to understand the strength of what he’s saying. This is strong language! This rebuke was not a sweet smile, you know, something really…no no no, it was firm, it was hard, it was direct, it was powerful! “But when Jesus turned and looked at His disciples, He rebuked Peter…” (Mk 8:33a) in exactly the same way. And then He said to him, “Get behind Me, Satan!…” (Mk. 8:33a) You know what He really said? If you go back to Mark chapter 1, when Jesus called Peter to follow Him, He said to Peter literally, ‘Come behind Me, line up behind Me, identify with Me, walk with Me, follow Me!’ (ref. Mk. 1:17) And what He’s saying to Peter is this, ‘Get behind Me, get in line, get where you belong, you are to be following Me.’ It’s the very same word. ‘Come behind Me! Follow Me! Don’t rebuke Me, don’t correct Me, don’t tell Me I don’t know what I’m talking about, don’t tell Me it won’t happen, I just told you it would! Get behind Me! Line up! Get in line!’ And He called him Satan. “Get behind me Satan…” (Mk. 8:33a) Is that because Peter had suddenly become satanic? Is that because Satan had suddenly taken Peter over? Can a man be taught by God and then dominated, controlled by Satan? I don’t think so. I don’t think that’s the point at all. I think He’s calling him Satan because, you see, we can understand and know truth…we can have accurate theology, but think like Satan. We can pursue our interests in the Name of Jesus. How can that be? Do you remember when Satan tempted Jesus? Do you remember how in every one of those temptations he tempted Jesus to do God’s will? He tempted Jesus to eat, which was God’s will (Mt. 4:3-4)…what good is a starved Messiah? He tempted Jesus to make this fantastic, phenomenal impression, come leaping off the temple parapet and come flying down (Mt. 4:5-7). And can you not see what an impact that would be? People look up and see this figure come flying down, the tails of His cloak behind Him? And then all of a sudden when it looks just like He’s going to crash instead the angels come along and grab a hold of Him and lift Him and turn Him upright and just gently place Him down on the temple grounds. How amazing can you be? But then there was that last one. ‘Worship me and I will give you all the kingdoms of the earth.’ ‘I will give you all the kingdoms of the earth’ (Mt. 4:8-10), God’s will for Jesus is to be the Ruler of all the earth. But Satan’s plan for Jesus was to do it without the cross. The interests of God demand the cross. The interests of God that holiness and justice and righteousness and mercy and love and compassion and grace all merge together at a place called Calvary. But the interests of man are to get the crown without the cross. You see, Peter had a misfocused mind. 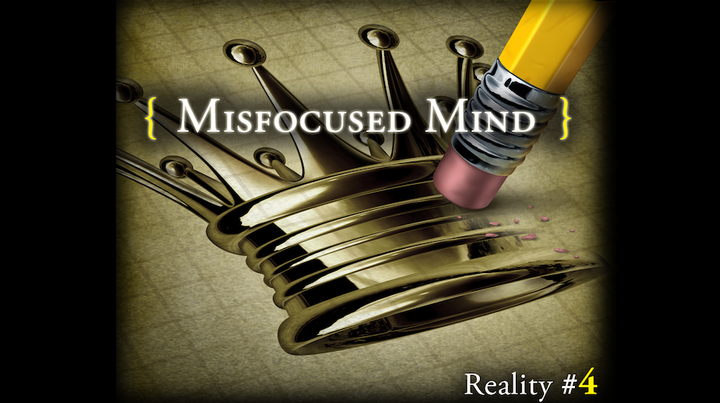 Reality #4 of the Seven Realities of the Altared Heart is the reality of a Misfocused Mind. With Peter, we pursue the interests of man rather than the interests of God, in the Name of Jesus. ‘Oh yes, I want my business to be an honest business…unless it’s going to cost me my whole business.’ ‘Oh yes, I’m a pastor, I want to glorify God…just tell me how great my preaching is on Sunday morning.’ You see, we have this mix in us. The mix of believing Jesus is the Messiah, the Christ, the Son of the living God and the mix of seeking to get what we want out of it. And what we want is a crown.